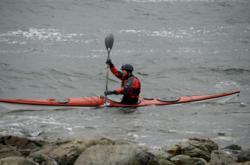 Liscombe Lodge Nova Scotia Resort kicks-off their 2012 summer season with the Atlantic Paddle Symposium May 11-14. We are excited to host this great event as we have a wonderful location nestled on the banks Liscomb River and next to the Eastern Shore of Nova Scotia. Liscombe Lodge Nova Scotia Resort welcomes the 5th annual Atlantic Paddle Symposium to their nature lover’s resort for this action-packed four-day event. The paddling symposium will take place from May 11-14. The Atlantic Paddle Symposium is the premier paddling event in Atlantic Canada and is taking place this spring at Liscombe Lodge. The 4-day event will bring together the Atlantic Canada paddling community and focus on skill development, leadership, education and paddling safety. The symposium is open to all paddlers, of all levels, who have a keen interest in improving their skills. This year’s event includes many paddling activities such as surfing, sea kayaking, and canoeing. While staying at Liscombe Lodge during the symposium, guests have exclusive access to complimentary on-site activities and facilities such as Nova Scotia hiking trails, biking, tennis, indoor swimming and much more. Registration for the 5th Annual Atlantic Paddle Symposium is now open! Register now to guarantee your Nova Scotia accommodations, as there are limited rooms available at Liscombe Lodge. Click here for more information. Tucked away on the tranquil shores of the Liscomb River on Nova Scotia’s Eastern Shore just two hours from Halifax, the Liscombe Lodge Resort and Conference Centre offers its guests a secluded destination to relax, unwind and enjoy nature in its truest form. This Nova Scotia resort offers accommodations that include rustic romantic chalets with fireplaces and verandas in secluded wooded surroundings, Riverside Lodge guestrooms each with private balcony overlooking the Liscomb River and spacious cottages, each with four bedrooms, private bath and common living area with fireplace and veranda, totaling 68 guestrooms. 16 km of beautiful Nova Scotia hiking trails, heated indoor pool, 2 whirlpools, sauna, fitness room, tennis court, shuffleboard, basketball area, golfing cage and putting green, giant chess board and bicycles all contribute to the many recreational options for a fabulous Nova Scotia vacation. Enjoy water tours, kayaking, canoeing, nearby beaches and bird watching. Local artisan’s creations are proudly displayed in the Gift Shop for purchase.